As usual twitter erupted into a bunch of people yelling and screaming for gun control, because well that’s what you do instead of nothing. Authorities said they believed the shooting was related to a domestic dispute. The man they identified as the suspect, *redacted*, 45, of Brown Deer, had a restraining order against him. So lets see here, restraining order and a serious domestic dispute. Hmm, there’s some amendment I remember that says those with Protective Restraining Orders against them cannot have firearms. What is it called again, oh yeah the Lautenberg Amendment. The act bans shipment, transport, ownership and use of guns or ammunition by individuals convicted of misdemeanor domestic violence, or who are under a restraining (protection) order for domestic abuse in all 50 states. The act also makes it unlawful to knowingly sell or give a firearm or ammunition to such persons. So what’s the score on this one. Gun control didn’t stop this murderer set on his mission. It could have very well prevented people from defending themselves depending on the policies of the spa and mall. It could have also prevented the victim from effectively seeking arms from the waiting period. Ultimately though we won’t know the true effect of either of those items. After the shooting, police said an improvised explosive device was found at the spa and a bomb squad is investigating, but they did not indicate whether the suspect ever tried to set the device off. Personally I prefer these nut bags go use firearms. There is a decent chance of survival and overall they are much less effective than explosives or fire. The bottom line is all the clamoring for gun control is yet another example of the failure of people to comprehend how to properly cope with tragedy. Gun control only does one thing really well. It ensures that the law-abiding victims are disarmed so the criminals can have their way without fear of failure. *I will not aid in giving this monster his 15 minutes of fame. Your response (link warning) does both of those quite handedly. So I am not sure you will be able to understand any of this or comprehend the logical reasoning, but as one of the men who is responsible for what the CSGV considers the most offensive response I can’t sit back and ignore this. I cannot sit back and ignore it as you spread lies and attack those who are my friends. My comments will remain open as always, and the only thing to be deleted from this thread will be SPAM, personal attacks, and things that wouldn’t be allowed in a decent society. So first let me apologize since I have no doubt this post is going to go Kevin Baker. So let’s get the broad facts out-of-the-way. 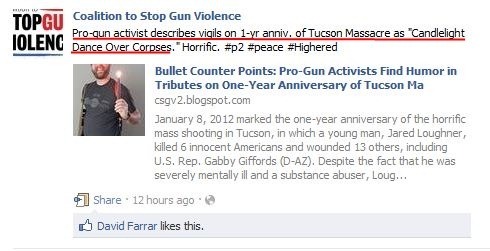 Fact: On the 8th of January 2012 there was a Brady Campaign organized vigil held for victims of Gun violence. The Brady Campaign defined this vigil as being for victims of gun violence. This statement was issued in a Youtube video posted December 18th, 2011. Those words are right straight out of the video from the Brady Campaign, and the video emphasizes that “Too Many Victims” was just about gun violence. Fact: Weer’d on or about the 28th of December issued a statement that gun-rights advocates should participate and memorialize all violence, not just gun violence. So on January 8th I ask everybody to post a picture of a lit candle and you carry gun. Because lit candles don’t do a whole lot but cast a meager amount of light…but a loaded gun in the hands of lawful citizens can do wonders to protect innocent lives from harm. Also “Gun Violence” is a bogus and made-up term, so on January 8th I ask you all to light a candle to stop VIOLENCE, and show you have the means to do just that. Fact: On the 8th of January a pair of gun bloggers and a group of USPSA competitors created a video of their vigil to violence. This was a vigil to all violence, not just gun violence. Shooters iterated how candles don’t stop violence. One shooter, myself, relayed a personal story. 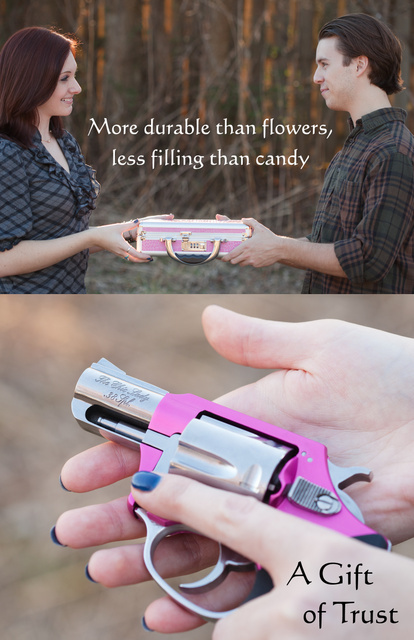 Both of my parents had defensive gun uses, it wasn’t a candle that stopped the violence, it was a gun. It closed with remembrance to two victims of violence. A candle would not have helped Kim’s husband who was stabbed. Nor would it have helped her grandmother who was violently beaten for her purse. That video focused on remembering violence and illustrating two important facts. You don’t have to be a victim. You can fight back. There are more victims out there than just victims of “gun violence”. Fact: There was a very nasty response to our vigil for all victims of violence with our statement of how we refuse to be a victim. 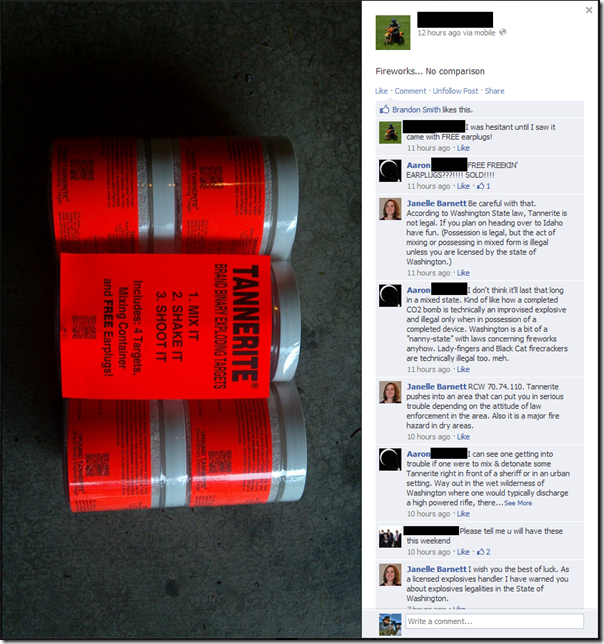 This included name calling and another outing rampage by the CSGV. 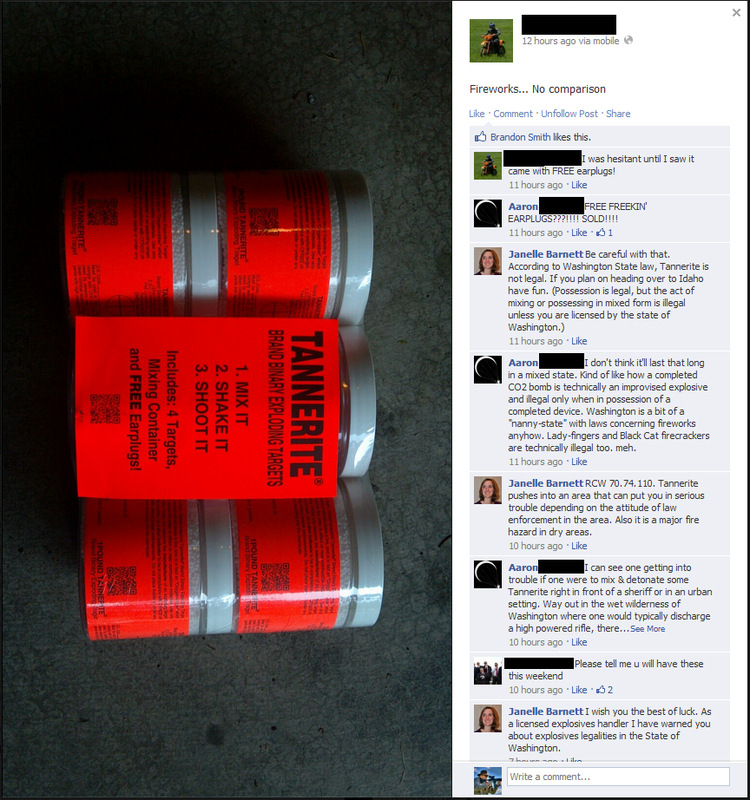 The CSGV on their Facebook also twisted words attempting to turn our vigil into something it was not. Fact: The Anti-Rights supporters have a history of threatening rhetoric and ill will towards who have different view points. Unlike you, when I make a statement, I present facts and evidence to prove it. This isn’t a one time occurrence either. See this post from Joe as well for even more. Now lets talk about your response. Your response towards Jennifer shows your lack of critical thinking. Writing in red is Joan’s own words. So Jennifer thinks no one would light a candle for Lydia? Who says? Why didn’t Jennifer come to one of our vigils and light a candle for Lydia? 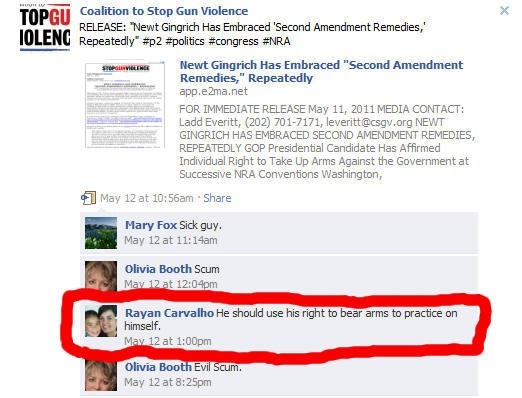 Because she would rather attack the vigils which were in honor and memory of shooting victims. So, Jennifer-sorry you missed our vigils. We would welcome you. Did you even read the story of Lydia? Joan, you stated right there in your own words that Lydia wasn’t welcome. The Brady Campaign video as shown above in the facts that Lydia wouldn’t count as a victim in your vigil. Lydia wasn’t a victim of “gun violence” so why would she be included? There is only one option as to why you would want other victim classes to appear at your vigil for gun violence. You want to dance in their blood as well to make it appear they are victims of gun violence to provide you another political tool. The real reason you dislike Jennifer’s post is because it shows your bias against other victims of violence. Jennifer herself is a victim, yet you attack her without thinking about what she is saying. You specifically call out comments that prove what I have said above. My personal favorite is that you attacked the comment from A Girl and Her Gun. That is more powerful than anything Joan or the likes of her could ever say.You are the one I admire. The one who fights for the victims and for the fight against violence. I am immensely thankful I am getting to get to know you. Also, Joan is stupid. A Girl and Her Gun is another victim of violence Joan. You even point it out earlier in your post as if some how citing it makes it irrelevant. The truth is though it’s that other victims of violence make you uncomfortable Joan. They illustrate that Gun Violence is a horrible metric and ignores a large segment of the population. Gun violence implies that those victims are some how worth more than someone who was violated without the use of a gun. These are the people who read my blog and then go and comment on other people’s blogs. 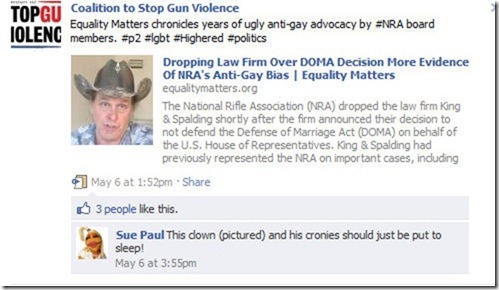 These are the people who the NRA represents. These are the people who think they can threaten, demean, name-call, abuse, belittle, and mock. During and after the candlelight vigils to honor victims of gun violence, the gun rights extremists ramped up their rhetoric. When did we threaten, demean, name-call, abuse, belittle or mock? We didn’t ramp up our rhetoric, we called for remembering all victims of violence, not just the one’s you find politically convenient. Which brings us to the next part of your statement. Victims make them nervous. They don’t like victims. They say we are “dancing in the blood of victims” when we light candles and ring bells. What’s that all about anyway? It’s a statement made often. I’m down right offended at that statement. I absolutely care about anyone who is a victim. I will do anything and everything to help them recover. What we don’t like, and despise, is some victims being treated as if they are some how not significant or worthy of notice. We don’t like the fact that anyone has become a victim in any type of crime. Victims, the real ones, we love and support. What we do want to accomplish is to lower the victimization rate. Where you would prefer the law-abiding disarmed, we would prefer them to fight back. We are willing to spend our time and money to help people not become victims. Here is a nice presentation of the differences between our culture and yours with regards to how we treat victims. Now why would I make a comment about “real victims”? Well it’s because in your effort to inflate your gun violence statistics you include criminals in your count. Criminals such as the man who broke into a woman’s house with a 12 inch hunting knife after she just lost her husband. The woman shot and killed the attacker, yet you include him as a “Victim of Gun Violence”. You know who was the real victim in that incident? The poor woman who was not breaking the law and was forced into a situation to defend herself and her child. 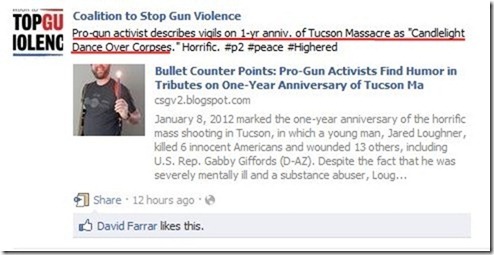 Who really cares about victims Joan? I wanted that woman and her child to survive. I wanted that store clerk at the Kroger’s robbery to remain unharmed. You however step up and defend the criminal. You wanted that poor woman to be shot so she could be another clear-cut victim for you to exploit for political gains. That’s why you’re a blood dancer. You prey upon the suffering of others to push your political agenda. 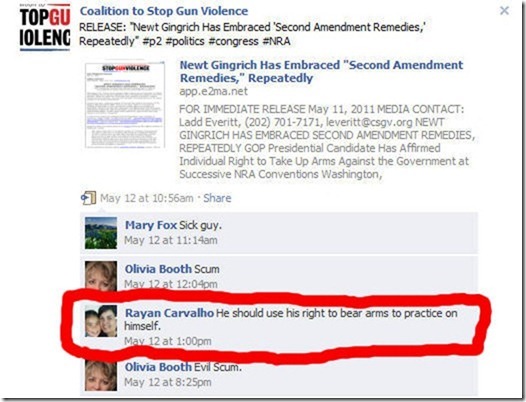 Even with the positive outcome, you actively pursued the incident in furthering gun control. There is a distinct difference in reaction after a horrible event occurs between our cultures Joan. While we immediately lower our head in mourning, sad at what we have lost. You go into overdrive pushing political legislation, giddy inside at the fuel it provides to pull at the emotional strings of the public. You know when people are emotional they very rarely are thinking rationally. What these folks don’t see is that their rigid resistance to any common sense gun laws that might actually prevent some of the shootings in this country results in more victims. Do they want more shooting victims? It’s odd that they don’t see how failure to do something has resulted in more victims. That’s the thing Joan, we care about all victims. Even more than that we want to enable people to have a choice and not be forced into victimhood. As for the last sentence, your assumption is that doing anything is some how good. What if you’re actions actually raise violent crime? Oh that’s right, you would consider more overall crime for less gun crime a win. And then, cynically, they try to find their own victims. The truth is that there are too many victims and they know it. Are you questioning whether or not A Girl and Her Gun or Jennifer are victims of violence? If so Joan, that’s just so wrong it’s not even funny. You’re less of a victim than they are since they both experienced it in the first person, they have the point of view of your sister, not yourself. Now if you’re not questioning that, are you saying we can’t find victims of Gun Control? Because lets ask Suzanna Hupp about that one. Honestly any victim in a gun free zone is a victim of gun control. They have had their choice regarding their own self-defense made for them. There are too many victims and it’s baffling that someone would be saying that victims should be disarmed. So to the pro gun bloggers who find it amusing to mock victims and survivors of gun violence, your words are here for all to see and they aren’t pretty. They portray a group of people who seem to believe that anything can be written with no consequences. Their voices represent a few loud, obnoxious and offensive people who are attempting to influence public policy in our country. Shame on anyone for listening to the voices of these people. We should all be offended. Again, you say we were mocking, where were we mocking? Our words aren’t pretty because we’re telling the truth Joan. You don’t find them pretty because the facts don’t support your false view of the world. As for our voices only representing a few loud people, here’s a loud dose of truth. Our impromptu effort that was completely unorganized resulted in well over a hundred of blog posts talking about victims they know and how they themselves are going to refuse to be a victim. So if we’re in the minority, why isn’t our video disliked overwhelmingly? That’s the difference between us Joan, you memorialize the past and twist history to infringe the rights of others. We on the other hand memorialize, learn, and act. We learned from our friends and family who were victims. We learned that there is evil in the world and you don’t know when it will arrive on your door step. You attempt to shame people for seeking more knowledge on the subject. Here I am reading your post, I find it deplorable that someone could so readily come to the defense of criminals by attacking the law-abiding, but I’m not saying you don’t have a right to say it. You’re upset because you don’t want people to see the truth. You don’t want people to realize that they don’t have to be a victim, that they can fight back, and if they do fight back they can win. You want us to be silent, well many of us would rather speak up because we find our lives worth it. And one last thing- I wonder how the bloggers and the people who comment on them would like to see things like this said about them in public? It’s something to consider before posting offensive things about another person. Do people like this think they can say anything on the internet? Do they know the person on the other end of the offensive and rude comment are humans with feelings and families and friends who fear for them when they see stuff like this? There’s the thing about “turning the other cheek” and there’s the thing about “doing unto your neighbors”. Those are things I learned in my church and practice every day. I don’t hide Joan. I post blogs under my real name. If you’re offended by us saying you don’t have to be a victim I suggest some serious therapy. Who wants more victims in the world? As for turning the other cheek and doing unto your neighbors, we do that. We do it better than your side possibly can. Funny thing is, they would never ask me to. As for myself personally I stop and help people all the time. I’m also ready should that person in need of help actually be a predator preying upon the good. The best compliment I ever received was not even directed at me, it was someone explaining my character to someone else, “He’s an Eagle Scout both literally and figuratively.” I am the guy that goes and shovels his elderly neighbors driveway and then turns around and helps the single mother next door with hers. I’m the guy who will get up and Oh Dark Thirty and come get you because you just had an auto wreck and you’re car is totaled. I am the guy who will go out of his way to help anyone. I am not the guy however who will stand to the side and let evil triumph. I am not the guy who will surrender to criminals who have violated me and thus surrendered the right for me to be civil to them. I don’t know where it says in the Bible that I should surrender Gods greatest gift to a criminal. I am reminded of a lesson told by OldNFO recently. If I were to arrive in heaven prematurely and not have fought every step of the way I feel that god would be disappointed that I would waste such a wonderful gift. Those who would force others to waste that gift are most guilty of that sin. I also wonder if these folks have mothers, sisters, children, brothers who see what they write and what they would think about their father, brother, son or daughter writing such vile things on the internet for all to see. At least I know that my integrity is in tact because I don’t choose to deploy tactics such as these. No comments will be published from pro gun activists on this post. Lastly Joan, my mom does read my blog. She sees exactly what I write. Sadly my father passed away, but I know he would be proud of me for standing up to those who would force victimhood on others. My mom is proud that I am willing to stand up and say what needs to be said despite the fear that I would be disliked for speaking my mind. Being despised by someone who would force others to be disarmed and strip away their rights is not an insult to me Joan. It is a badge of honor and one that I will gladly carry with me until the day I die. As for my integrity I have a very strict set of rules to protect it. I do so because “Integrity once lost can never be regained.” As such I never make a statement that I am unwilling to defend in public. This includes having open comments. Integrity means being willing to stand up behind that which you say. I suggest you really think long and hard about your response because you haven’t presented a single element to support your case. Also those you attack are also standing out in the open willing to freely debate, yet you hide unwilling to defend your position in public. That is a sign of someone who lacks integrity.